Against the backdrop of an endless, unwinnable war raging halfway across the world, and a polarizing president recklessly stoking the flames of racist backlash at home – a generation of young people rises up to demand change from a corrupt political establishment. It is October, 1969 and unbeknownst to the rest of the world, three 20-something radicals are busy planning the impending revolution from a quiet college town in Upstate New York. But when two strangers appear, disrupting the group’s delicate balance, new dangers and old wounds threaten to tear the collective apart. 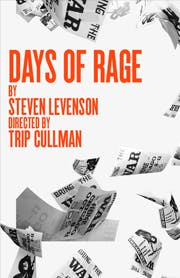 By the Tony Award-winning writer of Dear Evan Hansen, DAYS OF RAGE is a timely new play about means and ends, ideals and extremes, and the perils of changing the world.